Premium condominium project, Orchid Apartments II makes available the last of its fully equipped units for purchase, affirming higher return on investment due to it being surrounded by Malabe’s development boom. The apartment that is conceptualized to deliver a modern urban living experience, is designed ensuring those investing in the one of a kind property reaps the benefits of being located in an area that spells convenience and development. Orchid Apartments II comprises of 160 units tastefully slotted within 12 stories and features five different floor plans which are of; 1135 Sqft, 1000 Sqft, 1066 Sqft, 984 sqft and 631 sqft. Ranging from three to one bedroom apartments, all units within the complex boasts a picturesque view of paddy fields, incorporating a true feel of the green lushes of Sri Lanka into urban living. Malabe having become a part of the upscale residential boom of the Sri Jayewardenepura Kotte area during the past decade, investing in the luxury Orchid Apartments II assures speedy appreciation of the property, thus fetching higher returns in the near future. 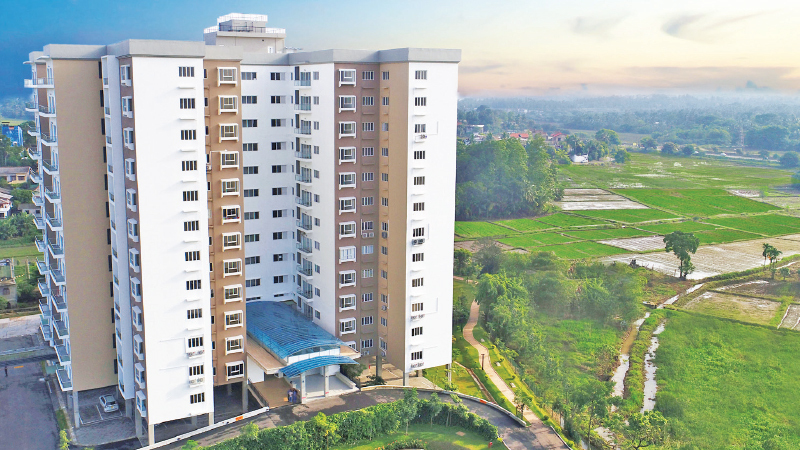 The Orchid Apartment is strategically located in a central position, offering direct access to the administrative capital Sri Jayewardenepura Kotte as well as easy access to, Colombo via Rajagiriya other financial hubs such as Nugegoda and Maharagama. The construction of the Southern Highway and the Outer Circular Highway, which has two exits and entrances located in and around Malabe, has made travelling to and from the apartment location increasingly convenient as the route has become one of the main path taken by motorists coming through Galle and Matara to get to Colombo. Noteworthy is also that the Outer Circular Highway offers easy access to the Ragama and Gampaha financial hubs. Adding value to the property will also be the Light Rain Transit (LRT) system that will be constructed in Colombo- Malabe route, as it is expected to revolutionize the transport system of the country. The LRT project has already received the green light by the Government and is scheduled to reach completion by 2021. The modernized Orchid Apartments II is located a stone’s throw away from a number of prominent and pertinent educational, healthcare facilities such as the; the Government Teaching Hospital, Dr. Neville Fernando Teaching Hospital, Sri Lanka Institute of Information Technology (SLIIT), South Asian Institute of Technology and Medicine (SAITM), and Colombo International Nautical and Engineering College (CINEC) and also Horizon International College. Orchid Apartments II is also within close proximity to headquarters of leading employers such as Millennium IT amongst other top companies. The ready to occupy Orchid Apartment II is an initiative of Nivasie and is contracted by the International Construction Consortium (ICC).